Boston audiences are invited to experience the spectacular new threesixty° stage production of J M Barrie’s "Peter Pan" performed in a state-of-the-art theater tent on City Hall Plaza for a limited run that's just been extended through December 30. More than 500,000 people on two continents have already enjoyed this unique theatrical experience conceived by an award-winning creative team and featuring 23 actors, puppets, music, and dazzling flying sequences performed in the world’s first 360-degree CGI theater set. One of the most striking elements of this new production is the setting in which it will be presented. The threesixty° Theatre, a 1,300 seat theater tent, allows for performance “in the round.” The entire interior of the tent is lit with more than 15,000 square feet of high-resolution video -- three times the size of Imax screens -- so that both cast and audience are immersed in the story. When Peter and Wendy fly to Neverland, the audience flies with them over 400 square miles of virtual London and beyond. Mayor Thomas Menino commented, "We are excited to work with threesixty° to bring this state of the art event to City Hall Plaza. A magical production of this timeless story will entertain and bring delight to people of all ages. This really builds on the success of the Big Apple Circus, activates the plaza with even more family friendly entertainment, and provides yet another reason to visit this great city during the holiday season." The threesixty° "Peter Pan" first captivated audiences in London during its premiere sixteen-week sold out engagement in May, 2009, in Kensington Gardens, where J M Barrie was first inspired to write the story. Since then a parade of international celebrities and their families have attended performances, including a Royal Gala attended by their Royal Highnesses The Prince of Wales and The Duchess of Cornwall (Prince Charles and Camilla). Since coming to the United States in late April 2010, American audiences have embraced the show in San Francisco, Orange County, Atlanta and Chicago. threesixty° entertainment, a theatrical production company based in London with Charlie Burnell, Matthew Churchill and Robert Butters as principals, commissioned a first class creative team to develop this production. The cast of "Peter Pan" will feature members of the original London production joined by American actors, making it a truly international company. 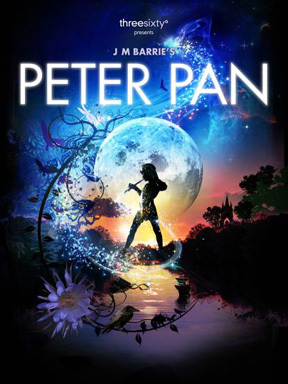 This production of "Peter Pan" is presented by arrangement with the Great Ormond Street Hospital Children's Charity and Samuel French Limited. Twelve projectors will be used to create the 360 degree effects. The theater will stand as the largest surround CGI venue in the world. Two hundred computers took four weeks to create the images used (it would have taken eight years for a single computer to render the same output). As well, the tent, which stands 100 feet high, was shipped via boat, 6,000 miles from London to San Francisco. Included as one of the London Observer’s “Hot 10 Must Do” events for 2009, the show was described by The Daily Express as "An immensely thrilling ride. A gem to be enjoyed whether you are 8, 18 or 80." David Littlejohn in The Wall St. Journal added that "Peter Pan" is “unforgettable. Visually dazzling. Peter Pan, Tinker Bell, Wendy and her two brothers fly against an unbelievably complex computer-generated cyclorama. The stage play "Peter Pan, The Boy Who Wouldn't Grow Up" was created by Scottish novelist and playwright J M Barrie in 1904. In the classic tale, Peter flies into the London nursery of the Darling children, Wendy, John and Michael, teaches them to fly and leads them to the magical Neverland, "second to the right and straight on till morning," where they live with Tinker Bell, the Lost Boys and meet the notorious Captain Hook. The story of Peter Pan has been adapted several times since then, including the beloved Walt Disney animated feature and the classic Broadway musical. However, it was not until this 2009 production, presented by threesixty° entertainment, that a production was performed in London’s Kensington Gardens where the original statue of Peter Pan has stood since 1912. This 21st century "Peter Pan" mixes history and magic in equal measure to present a story for adults and children alike. This new production is directed by Ben Harrison, designed by William Dudley, and adapted by Tanya Ronder from the Barrie story, with music composed by Benjamin Wallfisch. Choreography is by Fleur Darkin. For tickets, call 1-888-772-6849 or visit www.peterpantheshow.com.